Singapore – March 26, 2019 – Corvus Energy is proud to announce that we have been chosen to supply the energy storage system (ESS) for battery-hybrid RTG cranes by CCCC Shanghai Equipment Engineering (CCCCSEE). The order is for various retrofit and newbuild deliveries by its affiliate ZPMC in Chinese ports. Corvus Energy, with primary operations in Vancouver, Canada and Bergen, Norway, has previously supplied 48 RTG cranes through CCCCSEE. This is the first order for the new Corvus Energy Asia office located in Singapore. “Corvus Energy has definately shifted the economics and viability of converting diesel port equipment to battery-hybrid electric with their Orca Energy systems. Exceeding all requirements and expectations, Corvus ESS technology is a cornerstone of our future strategy for technological advancement. Through previous deliveries they have proven that the performance, durability and reliability of its battery systems are ideally suited to the demands of our port equipment,” said Gao Jianzhong, Chief Engineer, CCCCSEE. Bjørkeli, CEO of Corvus Energy. exceeds class requirements, to ensure the highest level of safety. technology, using hydrogen fuel cells. will be in service from 2021.
power to hybrid and all-electric heavy industrial equipment, including large marine propulsion drives. more than 2 million operating hours. The Environmental Award is awarded to a company, project or product that has made a significant contribution to a reduction in the environmental footprint of the OSV industry. February 12th, 2019 – Rolls-Royce Marine and Corvus Energy won the Environmental Award, sponsored by BDO-UK, at the Annual Offshore Support Journal Conference, Awards & Exhibition in London. The award was received for joint efforts in developing a state-of-the-art battery energy storage system requested for eight Rolls-Royce-designed, DNV GL-classed, newbuild platform supply vessels (PSVs) from COSCO Shipping Heavy Industry (Guangdong) shipyard. These PSVs will be operated by SEACOR Marine Holdings for worldwide operations once delivered as part of the vessel owner’s global hybridization program. Martyn Wingrove, editor of Offshore Supply Journal, points out that the technology was accepted and ordered for a ground-breaking newbuilding program in what is perceived as a tough time for this type of capital investment. In further recognition of their vision and environmental commitment, SEACOR Marine was also awarded Shipowner of the Year and its chief executive, John Gellert, was named OSJ Industry Leader. The offshore industry from across Europe, the United States, and key established and emerging markets from around the globe were represented at the OSJ Conference, with over 500 industry professionals converging in London for this year’s event on February 6-7. A highlight of this event is its dinner and awards, recognizing industry-leading innovation, operational excellence and achievement—voted on by a combination of distinguished judges and the readers of Offshore Support Journal. From dozens of award nominees, a shortlist is determined by the Offshore Support Journal Conference Advisory Panel comprised of a distinguished panel of judges from all sectors of the industry with many years of international offshore experience. The final winner the award is determined by the votes of the readers of the Offshore Support Journal. Corvus has a substantial track record of energy storage system (ESS) deliveries for offshore vessels. Corvus ESSs are proven to enable these vessels to consume less fuel, operate more efficiently and effectively, and emit substantially fewer greenhouse gases. Corvus Energy provides high power energy storage in the form of modular lithium ion battery systems. Its purpose-built, field-proven battery systems provide sustained power to hybrid and fully electric heavy industrial equipment, including large marine propulsion systems. NEWS RELEASE Bergen, Norway and Richmond, British Columbia, Canada – January 28, 2019 – Corvus Energy is pleased to announce that the company has been selected by Norwegian Electric Systems (NES) to supply lithium ion battery-based energy storage systems (ESS) for five new all-electric ferries being built by Havyard for Norwegian ferry operator Fjord1. The leading manufacturer of energy storage systems for maritime applications, Corvus Energy provides battery power to more ferries than all other providers of energy storage systems combined. Beginning with the first zero-emission ferry, Ampere, Corvus Energy’s ESSs have now been selected for over 40 similar short distance hybrid and all-electric ferries globally. Fjord1’s fleet modernization is impressive—the result of winning a number of tender competitions where low- or zero-emissions were specified by Norwegian authorities in an effort to reduce emissions from the ferry fleet. To date, Corvus Energy has supplied ESSs on eight Fjord1 electric ferries operating on four Norwegian coastal routes. “It is a pleasure to work with the technical team at NES. They are highly experienced in integrating batteries into electric power and propulsion systems and we easily get all the information we need to calculate the energy storage capacity correctly,” says Tommy Sletten, Team Leader Technical Sales Support at Corvus Energy. These five latest all-electric ferries are of Havyard 932 design and will be built in Havyard Shipyard in Leirvik, Sogn. Each ferry is 67 meters in length, holds 50 cars and will be equipped with air-cooled Corvus Orca Energy ESS that will supply electrical power to the ferry’s NES all-electric power and propulsion system. The Corvus equipment is scheduled for delivery in 2019 and all five ferries will be fully operational on four additional routes in Norway by January 1, 2020. Richmond, British Columbia, Canada and Bergen, Norway – November 14th, 2018 – Corvus Energy is pleased to announce that the Corvus Orca energy storage system (ESS) has been selected by ACEL AS. ACEL AS is part of the ACEL Group, which specializes in turnkey power systems and worldwide electrical installations on newbuilds, conversions and service work of marine vessels. The newbuild fishing vessel, a ST-156 XL design, will be built at Vaagland shipyard and is scheduled for delivery December 2019. The shipowner, H.P. Holmeset, is a pioneer within line fishing and is known for using innovative technical solutions to improve company performance. The new long-liner was developed in close cooperation with Skipsteknisk, focusing on a highly efficient vessel design that ensures minimal environmental footprint, state-of-the-art work environment and high quality production capabilities. The Corvus ESS battery, with energy storage capacity of 270 KWh, will be installed in the A-CELL Propulsion System from ACEL. The ACEL scope in the new building of MS Geir is complete engineering, electrical installation, including PMS, IAS and main switchboards and motor starter cabinets. “We are excited to be selected as the preferred supplier of batteries for this highly innovative design. The fishing industry, like all other maritime sectors, is seeking solutions to reduce overall operating costs and lessen the environmental impact. We see a clear increase in the demand for our products across all segments,” says Roger Rosvold, VP Sales at Corvus Energy. 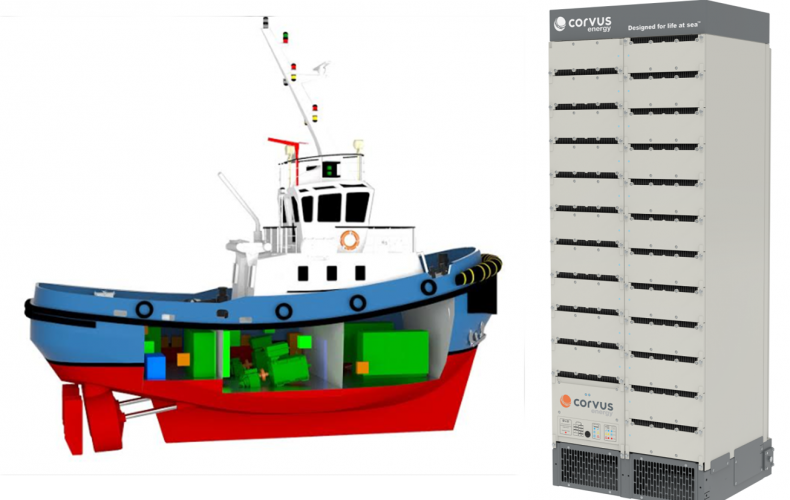 As the leading manufacturer of energy storage systems for maritime applications, Corvus Energy provides battery power to more hybrid or zero-emission vessels than all other providers of energy storage systems combined. Corvus offers the innovative Orca ESS solutions portfolio and has unsurpassed experience from 140+ projects, totaling over 100 MWh and 2 million operating hours. 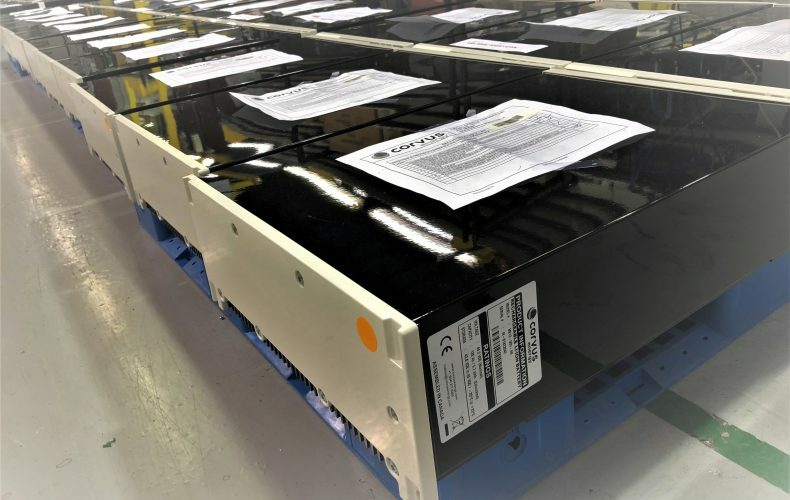 Richmond, British Columbia, Canada and Bergen, Norway – July 12, 2018 – Corvus Energy is pleased to announce that the Corvus Orca energy storage system (ESS) has been selected by Turkish ship designer and builder Navtek Naval Technologies, a subsidiary company of TK Tuzla Shipyard, for the world’s first battery-powered, all-electric tugboat. The Corvus ESS battery, with energy storage capacity of 1500 KWh, will provide power for two SIEMENS propulsion motors driving conventional propulsion system through ABB thrusters and drive systems, integrated by Turkey’s BMA Technology. As the leading manufacturer of energy storage systems for maritime applications, Corvus Energy provides battery power to more hybrid or all-electric ferries than all other providers of energy storage systems combined. Corvus offers the innovative Orca ESS solutions portfolio and has unsurpassed experience from 140+ projects, totaling over 100 MWh and 2 million operating hours. Canadian-Norwegian energy storage solutions provider Corvus Energy expands battery production facilities in Vancouver, Canada and announces intentions to build a factory in Bergen, Norway. Richmond, British Columbia, Canada and Bergen, Norway – July 11, 2018 – Corvus Energy is pleased to announce two production and R&D expansion plans underway in Canada and Norway. The new battery factories will be more modern and more automated than other similar factories, result in eight times the production capacity compared to today. First, the Corvus Energy factory in the Vancouver, Canada region will be expanded and upgraded to house a 200 MWh semi-automated battery production facility. A new product R&D, design and engineering facility will also be developed. The expansion is expected to be completed by the beginning of 2019. Secondly, a 400 MWh fully automated factory and a new marine system testing and development facility will be built in the Bergen region of Norway to fulfill strong growth in the Norwegian market resulting from new ferry tenders and high demand for hybrid energy systems in the offshore and shipping sectors. The new factory, test and development facilities are expected to be completed by the summer of 2019. The market for maritime batteries has seen strong growth in recent years, and Corvus Energy is one of the dominant suppliers in the market. The company develops and sells specially designed battery storage solutions for the maritime and oil and gas sectors and is a world-leading supplier of batteries for ships. “There is an electric revolution going on in the maritime sector, and we want to deliver the best solutions in the industry. These strategic locations of our R&D and production facilities will enable us to quickly test and develop new systems that can meet the future needs of the industry. Further, by switching from manual processing to automated production, we will increase production capacity and remain price-competitive,” says Geir Bjørkeli, CEO of Corvus Energy. Corvus Energy is a partner in the NCE Maritime CleanTech industry cluster, which is assisting with consultancy and project development in the planning phase of the Norwegian factory. “We have a strong maritime cluster in Western Norway, and the Corvus facility will strengthen our position as a global hub within maritime environmental technology. With a battery factory in the Bergen area, the industry will have close access to core products that are vital to ensuring that shipping is more environmentally friendly and more profitable for the ship owners,” says Hege Økland, CEO of NCE Maritime CleanTech. “It will be natural for us to link our R&D activities with other relevant R&D institutions. In this way we can strengthen the cooperation between industry players and research institutions, which will be beneficial to all parties,” says Corvus Energy’s Bjørkeli. Corvus Energy was established in Canada in 2009 and has its head office, sales, product R&D, design and engineering, and production facilities in Vancouver, Canada. The Norwegian part of the business, Corvus Norway, was established in 2015 and currently operates sales, service and marketing activities in the Bergen, Norway area. Investors include Equinor Technology Ventures and Norsk Hydro of Norway, and BW Group of Singapore. As the leading manufacturer of energy storage systems for maritime applications, Corvus offers the innovative Orca ESS solutions portfolio and has unsurpassed experience from 140+ projects, totaling over 100MWh and 2 million operating hours.